A square wave is a non-sinusoidal periodic waveform (which can be represented as an infinite summation of sinusoidal waves), in which the amplitude alternates at a steady frequency between fixed minimum and maximum values, with the same duration spent at minimum and maximum. The transition between minimum to maximum is instantaneous for an ideal square wave; this is not realizable in physical systems. 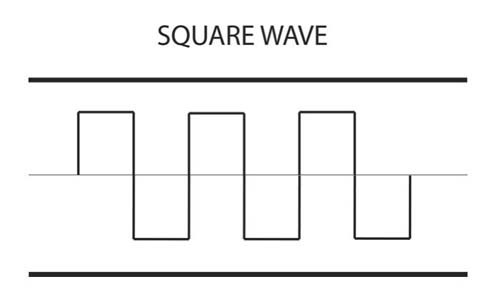 Square waves are often encountered in electronics and signal processing. Its stochastic counterpart is a two-state trajectory. A similar but not necessarily symmetrical wave, with arbitrary durations at minimum and maximum, is called a rectangular wave (of which the square wave is a special case). Non-sinusoidal waveforms are waveforms that are not pure sine waves. They are usually derived from simple math functions. While a pure sine consists of a single frequency, non-sinusoidal waveforms can be described as containing multiple sine waves of different frequencies. These “component” sine waves will be whole number multiples of a fundamental or “lowest” frequency. The frequency and amplitude of each component can be found using a mathematical technique known as Fourier analysis. In 1822, French mathematician Joseph Fourier discovered that any wave could be modeled as a combination of different types of sine waves. This applies to unusual waves like square waves and highly irregular waves like human speech. The discipline of reducing a complex wave to a combination of sine waves is called Fourier analysis, and is fundamental to many of the sciences, especially those involving sound and signals. Fourier analysis is central to signal processing and the analysis of time series, where seemingly random sets of data points are studied to elucidate a statistical trend. Fourier analysis is also used in probability theory, where it is used to prove the central limit theorem, which helps to explain why bell curves, or normal distributions, are ubiquitous in nature. A square wave is the least desirable output waveform type, it is considered sort of a “flattened-out” version of a sine wave. Instead of the voltage smoothly increasing from the negative maximum to the positive maximum and back again, it shifts suddenly from negative to positive, stays there for half a cycle, and then jumps to full negative and stays there for half a cycle, then repeats. Cheaper inverters are designed to produce a square wave output primarily because the components required to do it are inexpensive. However, some equipment doesn’t really run well on a square wave, but many types will run on it. There are several reasons why square waves cause problems. For starters, the peak voltage of a square wave is substantially lower than the peak voltage of a sine wave, which causes issues with some types of equipment. Additionally, while a sine wave has a single frequency of 60 Hz in North America, a square wave output is only found in the cheapest equipment and should be avoided if possible. Household appliances that work well with square wave inverters include computers, motor-driven appliances, toasters, coffee makers, TVs, VCRs, refrigerators, many microwave ovens and several other comparable appliances. Appliances that are known to have problems with a square wave inverter include some battery chargers, some battery operated items that recharge in an AC receptacle, some chargers for hand tools and other comparable appliances.